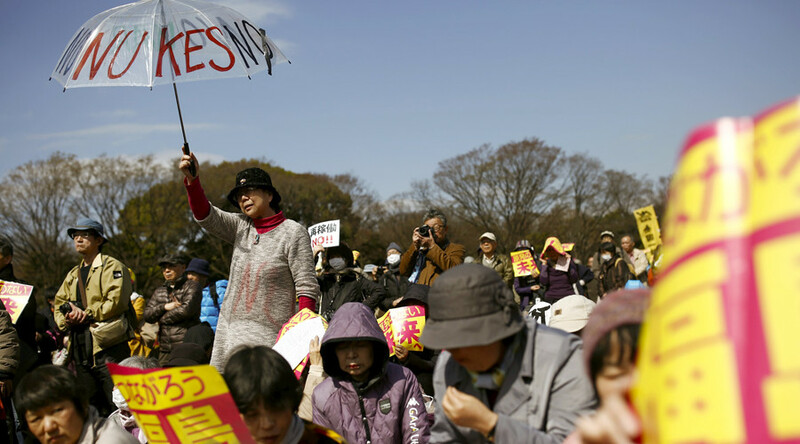 Over 30,000 people turned up for demonstrations in Tokyo to protest a plan being promoted by Japan’s prime minister to restart a number of nuclear power plants. On March 11, Japan marked the five-year anniversary of the devastating Fukushima disaster. Ruptly footage captured people waving flags, carrying banners, and holding up placards while marching through popular Yoyogi Park on Friday. The activists say that restarting the nuclear reactors will create safety risks. Some banners read “To the Absence of a Nuclear Power Plant Future,” local media reported. Japanese Prime Minister Shinzo Abe has been advocating the reboot of the country’s nuclear power plants, saying it is crucial for Japan’s energy policy. “Our resource-poor country cannot do without nuclear power to secure the stability of energy supply while considering what makes economic sense and the issue of climate change,” Abe told a press conference on March 11. He pointed out that only those plants meeting all new safety standards would resume operation, stressing that safety is the government’s “top priority.” According to the prime minister, the return to nuclear power will cut Japan’s reliance on costly fossil fuels that are currently being used to maintain the country’s energy supply. Despite official assurances, anti-nuclear sentiment runs high among the Japanese, who cite safety concerns. Many of Japan’s nuclear plants were decommissioned after the massive earthquake and tsunami that hit the northeast coast of Japan in 2011, resulting in the meltdown of nuclear reactors at the Fukushima power plant and the release of massive amounts of radioactivity, in the largest nuclear disaster since Chernobyl. Japan restarted two nuclear reactors in 2016 and two others the year before.